Cheryl Ann Thomas delights in the unexpected and relishes the moment her hand coiled porcelain and stoneware vessels assume a life of their own. Constructing these sculptures is an intimate process involving meticulous care, with the artist carefully assembling coil after coil. 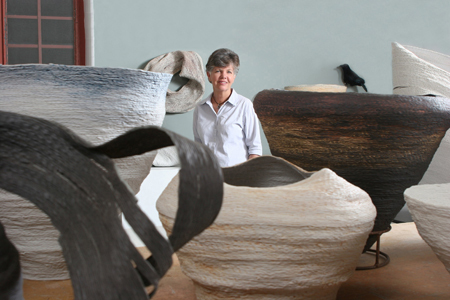 During the firing nature takes over and the variables of climate and clay, the artist’s eye and fate come together to create vessels that seem at once modern and ancient. Cheryl Ann Thomas’ documentation took place in 2007 and was sponsored by Jo Ellen and Stephen Lee and the Jessica and Stanley Prescott Trust. The FOTM Archive contains extensive information about this artist.